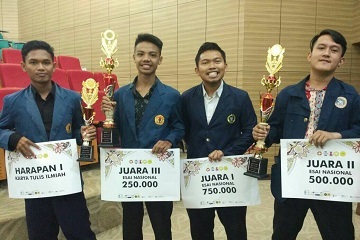 Maliki Febriantono S, Student of Faculty of Agriculture, Bogor Agricultural University (Faperta of IPB) won the First Winner of the National Essay Competition “Muslim Culture Fair 3” at the end of last year in Jakarta. The National Essay Competition held by the Student Executive Board, Islamic Studies Program, Universitas Negeri Jakarta (UNJ) raised ‘Revitalisasi Peran Media dalam Membangun Peradaban Islam di Indonesia / Revitalizing the Role of Media in Building the Islamic Civilization in Indonesia’. “It is selected ten best essay works. The participants come from Universitas Negeri Jakarta (UNJ), Universitas Mataram, Universitas Hasanuddin, Universitas Sumatera Utara, Universitas Airlangga, Universitas Jambi, and IAIN Salatiga. Then from ten finalists, it is selected five the champions,” said Maliki. Maliki revealed, the idea of this essay started from his unrest as a young Muslim with the rise of kids aged 8-11 years who had stuck with love and drugs who were now called kids zaman now / kids at the moment. They had experienced what the so-called demoralization in all aspects of life, and it certainly happened, because Islam and the faith did not stick in in the hearts of the kids today. Most kids at the moment tended to dislike the Islamic religious lessons. They were the generation who watched. It was difficult to find the Islamic learning media today. “From there, I have an idea to make the Islamic learning media that modify the games of snakes ladder and monopoly, so that it becomes a unique and creative learning media,” said this Madurese-born man. Because according to the research, the kids were more likely to like something in the form of images or visuals, so that they could reach the religious lessons, while they were playing and learning which was fun.